Versatility. It’s why you bought your truck. You can carry almost anything you’ll need. You can tow. And because you have a Supercrew, you can take your entire family along. Your F-150 is a vehicle you can use for everything, but can you make it even more versatile? Of course you can. In terms of customizing your Ford, truck bed mods are the easiest way to increase its versatility. You can transform your bed into just about anything with some F-150 truck bed accessories. Let’s get started. 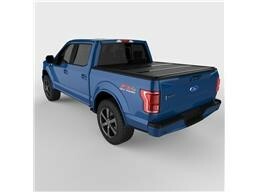 Among Ford truck accessories, Tonneau covers generally have their pros and cons. On the pro side, you get to weatherproof your cargo and protect it from prying eyes. On the con side, however, tonneaus can be a pain if you need to haul anything longer or taller than your cargo box. Soft tonneaus can generally be peeled or folded back to make way for this cargo, but getting them back into place can be a long, annoying process, and soft covers are susceptible to any thief with a knife. Hard covers are more secure, but less usable with large cargo. You have to plan what you’ll be carrying ahead of time and possibly remove the tonneau to leave it at home. Now there’s a tonneau that’s both secure and easy to get out of the way at need. The Undercover Flex is a unique, tri-fold tonneau that flips up and out of the way in three sections and locks back down in place, flush with your bed rails, in seconds. When you have it folded down, the Flex is the most weather tight folding tonneau you can buy. It’s made of Fiberglass Reinforced Plastic, or FRP, which is super strong and resistant to UV rays while being lighter than aluminum. It can only opened when you have your tailgate open, so as long as you have that closed and locked, no one can open the Flex. When you want to get the Flex out of the way for bigger cargo, you simply pull one of the latches (there is one on each side, and they’re linked for ease of access), and flip back two sections. At this point you can either leave them flat on the bed rails, clipping them in place with the built-in restraint buckles, or, if you need more space, you can raise the whole, folded tonneau to a vertical position behind the rear glass, supporting it with the two prop-rods. You can carry your tonneau everywhere and lose virtually no space or functionality in the bed. Finally there’s a tonneau without consequence. You can just leave it on and transform it as needed. Installation only takes a few minutes and requires no drilling whatsoever. And the Flex is made right here in America. Sometimes versatility means leaving your tailgate down so you can haul certain items. But as you know, leaving your tailgate unlocked in any form can get it stolen pretty quick. Popping the tailgate off whenever you need to is a nice feature, but it leaves you needing to worry about it. Formerly. You don’t have to worry about it now, of course, because you can install this Pop & Lock Gate Defender tailgate lock in seconds and just leave it. It’s incredibly easy to install. There are five steps. One is opening the tailgate and another is closing it, so that might give you an idea. You don’t even need any tools. 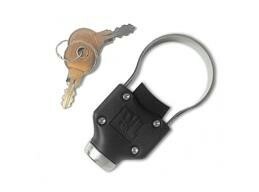 It’s just a brilliant little locking collar that goes around the hinge to prevent theft. Keep the key on your key ring and call it a day. You don’t need to worry about forgetting to lock that gate. And it won’t impede tailgate function or scratch your paint. That Flex tonneau can keep things from moving vertically out of the bed, but what about keeping them from sliding around when they’re in there? Stuff can get damaged just rolling and bouncing around. The Loading Zone Cargo Gate prevents all that with a simple, lightweight barrier that you can put anywhere in your truck bed. The Cargo Gate clamps against the sides of your truck and stays there, holding up to 65 lbs of stuff behind it before it will budge. It’s the perfect way to keep your cargo from sliding or rolling around and getting damaged. It installs in seconds, and it only weighs 6.5 lbs. Now, here’s an important note. The Cargo Gate is designed to brace against the sides of the bed rails. If you install the Flex tonneau, or several other tonneaus that mount against that surface, the Cargo Gate won’t be able to brace there, so please keep that in mind. 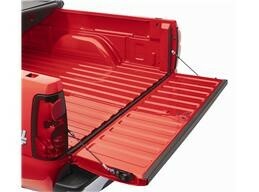 Loading Zone recommends this Cargo Gate for use with the F-150. Speaking of that tonneau, remember how it’s so good at weatherproofing your truck bed? It can only do so from the top. Your tailgate is left unsealed around the bottom and sides to properly drain water that falls into the bed. But now that you’ve got a roof on that bed, it’s a good idea to seal the rest, as well. Lund’s Tailgate Seal will do just that, locking out the dirt and water that would creep into your newly roofed bed. It’s super quick and easy to install. Just peel off the backing to the 3M adhesive, stick it onto the surface that needs to seal, and trim off the extra. The seal is made of extruded EPDM rubber for a durable seal at any temperature, unless you launch your truck at the sun. So you’ve weatherproofed the inside of your bed, but the effects of debris and moisture can still do some serious damage to the outside of your bed, specifically the underside. The wheels wells are particularly vulnerable. Here’s what happens: You drive along on a gravel road (or a salted, paved road), and every single pebble you roll over becomes a bullet, firing straight at your fresh, factory paint, also known as the only protection for the metal. The paint wears away, and the metal is exposed. Frankly, Ford (and most other truck manufacturers) really drop the ball, here. Protection for this area should come standard. But it doesn’t, so Husky Liners saved the day with their Wheel Well Guards. Husky, we know, already specializes in incredibly durable plastics – their floor mats are virtually indestructible. So when they say that their wheel well liners are tough and warrantied for life, we’re pretty much forced to believe them. 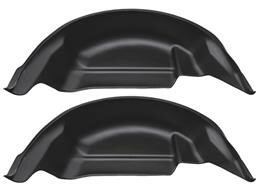 These guards fit up above your rear tires and protect the underside of your bed from gravel, salt, and other debris. Installation is extremely simple. You don’t need a drill, just a screwdriver and a few minutes to mount the guards to the existing holes on your truck. They spray clean and create a finished, complete look for your truck. Our final recommendation isn’t for your truck bed at all, but rather for climbing into it. Once you lift your truck (stay tuned), getting into the bed, or up to that level to fetch something out of it, can be tricky. The same can be said for the cab. So N-Fab came up with a solution for all your truck climbing needs: front seat, back seat, and bed. Enter the N-Fab Bed Access step bar. Each bar has three high-grip step loops, one at each door and one in the back so you can climb up into your bed. It’s great for operating your Flex tonneau, grabbing something out of the bed, or climbing up there when you need to get in. N-Fab bars are welded for extreme strength and durability. Each side can hold up to 465 lbs. They’re powder coated against rust and finished in an attractive black, fitted high and tight against your truck body for a cool, integrated look. 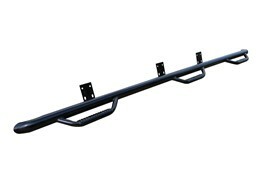 They help fend off debris from damaging the sides of your truck. And they install quickly, using existing holes, so you don’t have to do any drilling. Plus, they just look awesome. Seriously. Look at how awesome they are. N-Fab offers a lifetime warranty on the construction and a 5-year warranty on the finish. With just a handful of simple Ford F-150 accessories, we’ve changed your truck bed from a basic, aluminum box to a full utility Transformer, complete with the ability to do whatever you need it to do. Keep in mind that these selected part numbers are designed for a 2015 F-150 XLT Supercrew with a 5.5 ft bed, and if your truck differs, they might not fit. But we can help you find the parts that will, so drop your questions in the comments section below, or give our expert, in-house, American techs a call at 877.787.8989, and they’ll point you in the right direction. What are your favorite 2015 Ford F-150 truck bed accessories?